Last August in Bogotá, Colombia, Victaulic participated in the first edition of the fire protection exhibition at the International Security Fair E+S+S. The event was attended by 400 exhibitors, 12,000 visitors, 1,657 exhibitors. The event featured 90 conference sessions (technical-commercial) and five union forums attended by and 2,700 participants. Before the official start of the expo, the National Association of Automatic Fire Sprinkler Systems Colombia -ANRACI COLOMBIA invited Victaulic’s Codes & Standards specialist Kevin Kelly to present at the First International Conference on Fire Protection. Kevin presented on upcoming changes in the next edition of NFPA13 and the ways that these changes might impact the market. Some of the upcoming changes are highlighted below. The original document was published in 1896 and the last major redesign until now, was done in 1999. The 2019 document is restructured to eliminate redundancies or duplications and to improve the chapter order to make it more consistent with how a sprinkler system would be designed. The intent is to make the document more user friendly. The storage application chapters are reorganized by sprinkler type instead of storage arrangement. Hanging and bracing rules were separated from the seismic rules. The design criteria and the hydraulic calculations were combined into a single chapter. A new chapter was added covering modifications to existing fire protection systems. The following day at the ANRACI conference, Kevin presented on new technologies for the installation of 1-inch piping in fire protection systems. During his presentation Kevin provided an overview of how technology for joining 1-inch pipe has changed from threading to a field grooving solution. Additionally, Kevin introduced the newest innovation for the installation of sprinkler heads in storage applications, FireLock™ IGS™ Installation-Ready™ Sprinklers. The Style V9 and grooved-end sprinkler heads are provided pre-assembled and eliminate the sprinkler prep work on the ground that’s required for traditional threaded sprinkler heads installations, keeping installers working in the air and increasing productivity. The Style V9 coupling is an Installation-Ready one-bolt coupling, which simplifies sprinkler installations and eliminates rework associated with overtightening of threaded sprinklers. 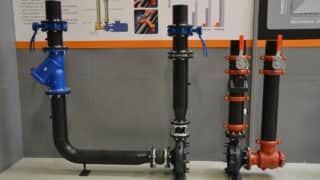 Utilizing mechanical connections where possible instead of threaded connections ensures less down time from leaks. The installation of the grooved-end sprinkler requires less effort – eliminating sprinkler wrenches needed for threaded connections and reducing injury from repeated strenuous motion. The new mechanical joint increases confidence since it features “visual inspection” of leak-free installation and ensures proper sprinkler frame arm alignment without imposing excessive installation torque. Check out more information about these products here. On the second day of the conference, Wilfredo Blancarte, Victaulic’s Regional Manager for Fire Protection in Mexico and Central America, presented on the Victaulic Vortex™ Hybrid Fire Extinguishing System. Wilfredo highlighted the attributes and benefits of installing such an innovative and environmentally friendly solution. During system activation, the Victaulic Vortex system generates a hybrid media, a combination of inert gas, typically nitrogen, and atomized water creating an atmosphere that does not support combustion. The inert gas dilutes oxygen and is used to atomize the water into small (10 micron) droplets. The atomized water droplets provide a large available surface area for heat absorption and are easily converted to steam to provide cooling and oxygen dilution. In addition, these systems provide the fire protection engineer with an option to address concerns with life safety, limited water supply, room integrity, costly clean up and potentially damaging water run-off. Victaulic Vortex is an effective alternative to clean agent systems commonly utilized to protect special hazards, like data centers, power generation stations or equipment and museums and archives. For more information click here. ANRACI conducted a live side by side demonstration comparing the extinction of a fire reaching temperatures of up to 300°C. The first room did not have a fire protection system in place and therefore had to be extinguished by firefighters from the city of Bogotá. 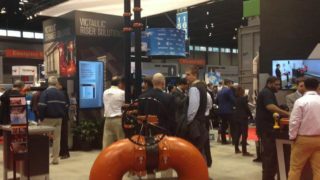 The second room exhibited the use of a fire protection system using Victaulic FireLock V27 sprinklers, which extinguished the fire in less than a minute. Click here to watch the ANRACI’s video of the live demo. Victaulic is proud to support the fire protection industry in Colombia and this event was a great opportunity to spend time and share our industry expertise with fire protection professionals in the region. 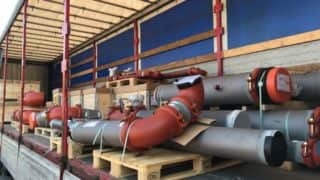 We are also thankful to three of Victaulic customers in Colombia whose support positioned Victaulic as a leading brand in the Colombian fire protection market: Victaulic Vortex integrator Agnis and our distributors Tuvacol and Pipe Grooved Solutions.